The Americans, world champion runner-ups in 2012, have announced their 23-player roster for this year’s tournament in Ottawa, Ontario. The United States will look to avenge their 5-4 overtime loss to the Canadians in the gold medal game last year by taking gold this year, and returning the favor of defeating Canada on home ice. Below is what Team USA will look like. All of Team USA’s forwards are fairly young. They’ve got a solid mix of young stars and veterans who are still in the prime of their careers. The U.S. has a pretty deep attack, and will probably get contributions from many different forwards. A few of their likely top scorers are Jocelyne Lamoureux, Monique Lamoureux, Hilary Knight, and Amanda Kessel. The Lamoureux twins made up two-thirds of the best line at last year’s tournament. Unfortunately Kelli Stack, the other player on that line, will miss this year’s tournament due to injury. The Americans won’t be able to truly replace her, but the Lamoureuxs still project to be a dominant duo. They’re tenacious and physical, and putting up points is almost second-nature to them. Hilary Knight is coming off of a fantastic rookie season in the CWHL. She was third in the league in scoring, putting up 17 goals and 32 points in 24 games with the Boston Blades, and was named the league’s Most Valuable Player. Knight is one of the best pure goal scorers in the world, and she really thrives playing in the U.S.’s system, so she’ll figure to be an important part of this offense. So will Amanda Kessel, who had a ridiculous season with the Minnesota Golden Gophers. She was named the 2013 Patty Kazmaier Memorial Award winner after scoring 46 goals and 101 points in 38 games. Kessel was a little banged up at the end of the season, so her production slowed, but she was as dynamic as ever in the national championship game. She’s definitely one of the fastest players at this tournament and is sure to enter it with plenty of confidence, which spells trouble for Team USA’s opponents. Two important veterans up front for the U.S. are Julie Chu and Meghan Duggan. Chu was recently named captain of the squad, and she’s been a mainstay on the national team for years, having played in the 2002, 2006, and 2010 Winter Olympics. She’s got plenty of skill and is a very dependable player all-around. Duggan will serve as one of the team’s alternate captains, which is no surprise considering the leadership and intangibles that she brings to the table. She’s one of, if not the best two-way player in the world, so she’ll be a leader for the United States in all situations. Kendall Coyne, Brianna Decker, and Alex Carpenter are some of the younger stars for Team USA. This will be Coyne’s third World Championships, which is pretty impressive considering how she’s only a college sophomore. She’s extremely fast and gifted, and is great at winning battles in the dirty areas despite her smaller stature. Brianna Decker’s point totals regressed this past season after she won the 2012 Patty Kazmaier Award, but she still carried Wisconsin for pretty much the whole season. She’s a very dangerous player when she’s on her game. This will be Carpenter’s first major tournament with the senior team, but she’s ready for it after really breaking out this past season at Boston College. The three of them can help to give the Americans’ attack a great deal of depth if they consistently pressure their opponents’ defense. Looking at the remaining forwards on the U.S. roster, it seems like USA Hockey was aiming for as much offensive depth as possible. The final four forwards are Sarah Erickson, Lyndsey Fry, Jen Schoullis, and Kelley Steadman. All four have been pretty productive players throughout their careers so far. Erickson was a senior on Minnesota’s national championship team in 2012, and was a point-per-game player over the course of her career there. She’s definitely got a good offensive skillset, but it’ll be interesting to see where she slots in on this depth chart. Schoullis is also gifted offensively, but she’s a great penalty killer as well and has a lot of value there. Fry plays for Team USA head coach Katey Stone at Harvard, and she’s one of the Crimson’s top scorers. She’s got a good possession game when it comes to cycling the puck, and a wicked shot. Steadman just finished her rookie season in the CWHL with the Boston Blades. She’s probably not going to produce a crazy amount at this level, but she’s still a reliable player who can generate offense. Steadman also has good size, which is one thing the U.S. lacks up front. The U.S. blue line has an interesting mix of abilities. Pretty much all seven defensemen here are solid players all-around, but each brings a few different things to the table. Two of the leaders of this defensive corps will without a doubt be Kacey Bellamy and Megan Bozek. Bellamy was named the other alternate captain, and she’ll be counted on to set the tone for the rest of the defense. She brings a lot of tools to the table: smooth skating, great passing, puck control, and vision, and a very sound defensive game. She’s not afraid to get physical to stand up opposing players, either. As for Bozek, she’s got the same kind of two-way skills, although she’s still kind of a rising star. After a great senior season at Minnesota, she could have a huge impact on how this tournament plays out for Team USA. Besides Bellamy, Gigi Marvin and Lisa Chesson are the two other veteran players on this blue line. Both competed in the 2010 Winter Olympics. Marvin, however, was a star forward for much of her career before making the switch to defense a couple of seasons ago. She can be a bit shaky defensively, but she really bolsters the U.S.’s puck controlling abilities on the back-end. Chesson might not be the most dynamic defenseman, but she’s got good defensive value and she’s dependable. Anne Schleper will be one of the most important players for Team USA. She’s grown a lot as a player over the past couple of seasons, and consistently makes good plays on both sides of the puck. The depth of the Americans’ defense improves tremendously if her, Bellamy, and Bozek are all playing to their potential, because they are the U.S.’s best two-way defenders. Michelle Picard will also be extremely important to this defensive corps; she really stepped up this season for Harvard, becoming an anchor on their defense even though she’s just a sophomore. She’s got some untapped offensive potential, but her real strengths for now are her shutdown abilities and decision-making. Lee Stecklein is perhaps the biggest surprise on this roster, as she’s only a freshman at the University of Minnesota with no previous experience with the senior team. She had a successful first season with the Gophers, scoring a respectable three goals and 12 points from the blue line. Stecklein might not be the most dynamic player, but she’s well-rounded and has size, which could really help Team USA in a match-up with a big, physical team like Canada. With Molly Schaus not competing in the tournament this year, Jessie Vetter is the likely number one goaltender for the U.S. A former Patty Kazmaier Award winner, Vetter’s been a great goalie all throughout her career. Schaus edged her on the depth chart at the 2012 World Championships, but Vetter was Team USA’s go-to netminder for a while before that, including at the 2010 Olympics. She should be able to step right back up this year as the squad’s top goalie. It’s hard to tell who between Brianne McLaughlin and Alex Rigsby will earn the number two slot. 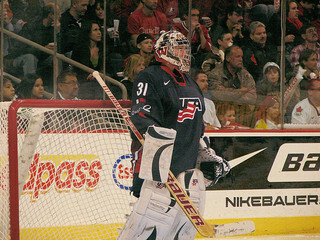 Rigsby’s more talented, but McLaughlin has been the Americans’ the third-string goalie for years. Although Rigsby doesn’t have as much experience with the national team, she’s really come into her own over the past couple of seasons at the University of Wisconsin. She sees a lot of rubber playing for the Badgers and still stops most pucks she sees. Going just by performance, she’s probably got the edge over McLaughlin heading into the tournament. It looks like the last few forwards who made this squad were picked based on their generally reliable play and high offensive ceilings. The U.S. could be trying to replace the offense of the injured Kelli Stack, and they also could be making an effort to win their lower-line match-ups when they play the Canadians. If all four lines are able to create offense against Canada, it will greatly help Team USA’ s chances at winning gold. The Americans have put together a team with the same kind of dynamic as last year’s squad. There’s a lot of versatility here but they’re built around speed and passing. Pretty much every player here is a good skater and can pass the puck well, from the defense out. Team USA will look to play a fast-paced game and really bottle up their opponents with their offense and fore-checking. Although some of their players are on the smaller side, the team as a whole plays with a lot of grit and cycles well, and they will rely on that as well to establish their up-tempo game.